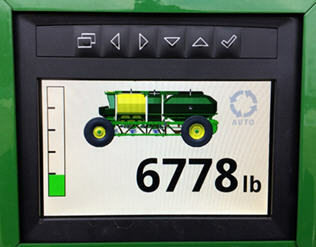 Tank weights and bin level will be shown on the first screen when the display is powered on. 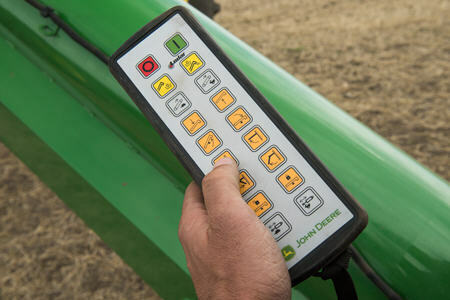 Navigating from one tank weight to another will be done by pressing the left and right arrow buttons. 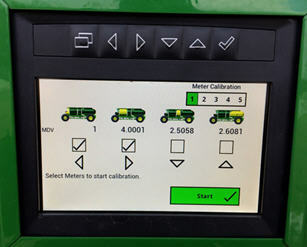 Meter calibration can now be done cart side. 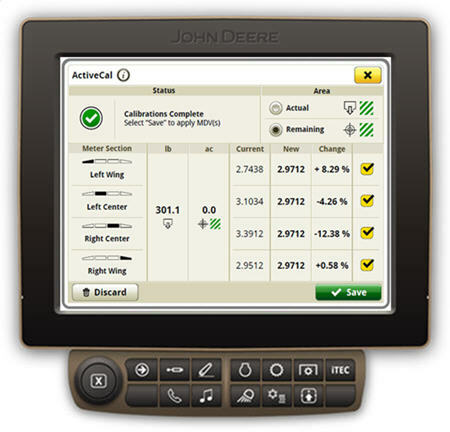 To select the tank or tanks you want to calibrate press the display button that matches the icon below the respective tank on the screen. 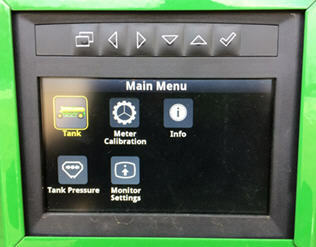 The digital screen replaces the mechanical tank pressure gauges on previous carts. 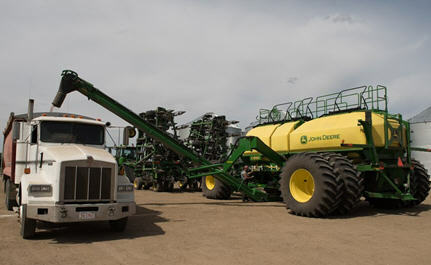 The total capacity of the C850 is 29,953 L (850 bu), measured by conveying product into the tank. 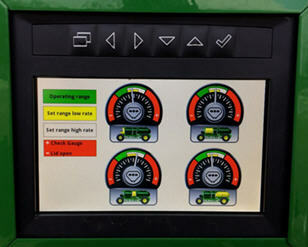 The front tank is dedicated for low rate applications and holds 1762 L (50 bu). 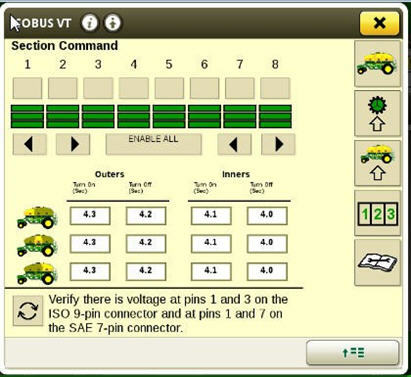 The remaining three tanks in order of front to rear are 9162 L (260 bu), 4581 L (130 bu), and 14,448 L (410 bu). 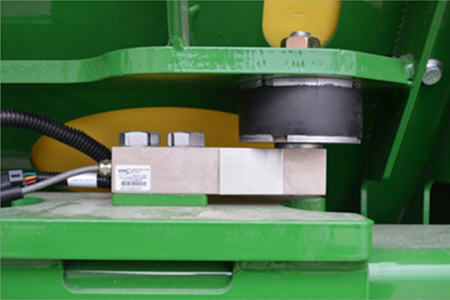 The improved top bevel design on tanks allow for greater capacity and meets the 29,953-L (850-bu) capacity without the need for shoveling product into the corners while conveyor filling. 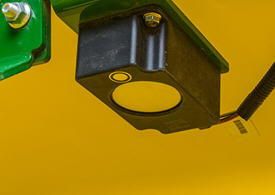 Each tank has a wide single opening, which means it is easy for access for the conveyor and entry to the tank. Inside each tank is a ladder for cleanout access. Ladders in the tanks have been designed so that material cannot build up on steps. Top rails have been capped and sloped to ensure product sheds from the surface. When cleaning out the cart, the tanks slope steeply at bottom for product to flow easily and each tank is accessible for fill and cleanout with the conveyor. 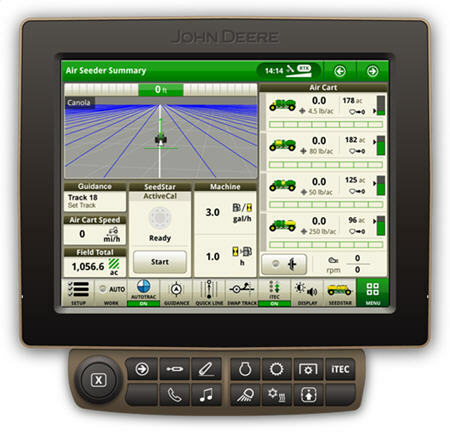 The C850 comes standard with the wireless-controlled hydraulic conveyance system with a low-profile hopper. 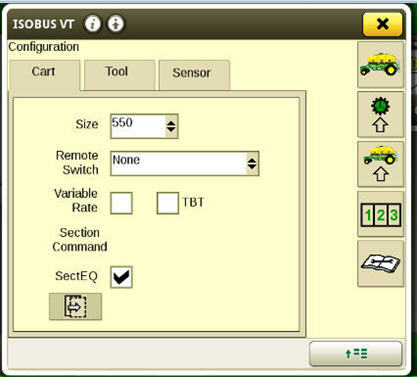 Maneuvering the conveyor can be done from the wireless conveyor remote or the remote tethered to the cart. 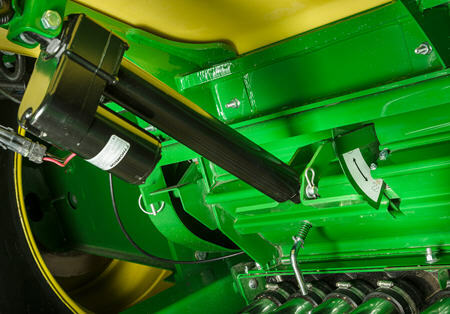 With five pivot points on the arm, all tanks can be filled from one spot. 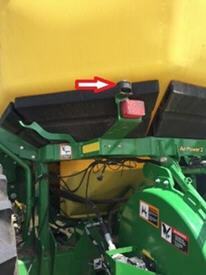 The pivot points also allow the conveyor to be easily positioned and moved when filling from a seed tender. 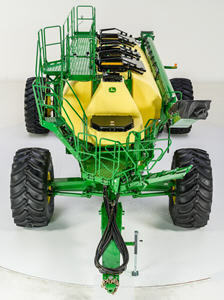 This conveyor moves up to 3524 L (100 bu) of product in a minute with a 40.6-cm (16-in.) belt inside the 30.5-cm (12-in.) tube. 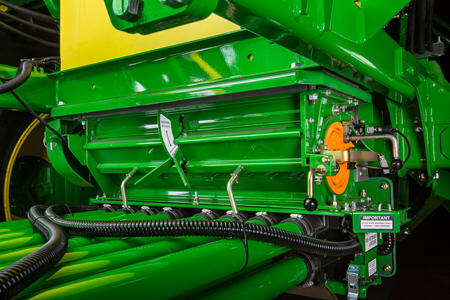 By moving the hopper under meter, the conveyor can be used for clean out on each tank as well. 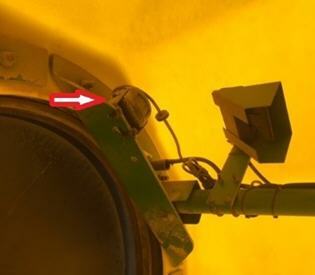 The shut-off switches on the conveyor are located at the bottom of the tube, above the hopper and at the top of the conveyor near the spout. 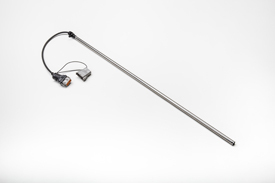 Filling at night is easy with the light-emitting diode (LED) 900-lumen lights on the cart and conveyor conveniently placed to illuminate each meter, the stairway and platform. 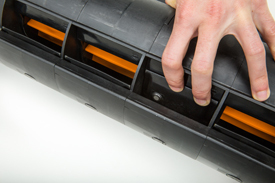 The C850 has five tank lids to make filling convenient and quick. 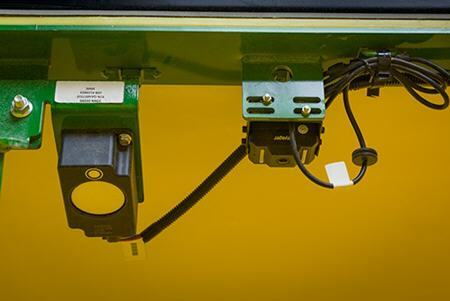 The three back tank lids are operated by pushing forward on the foot pedal and straight down on the handle. 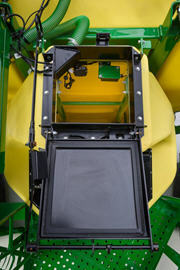 The lid slides out of the way, contouring the shape of the tank, so it does not interfere with the conveyor. 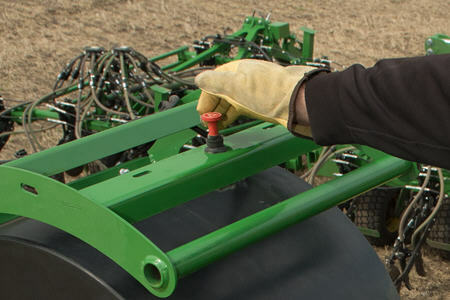 The tank lids seal tight by pulling upward on the handle and stepping back on the foot pedal. 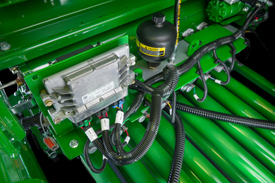 The three back tank lids offer a wide opening, making an easy job out of placing the conveyor in the right place during fills. 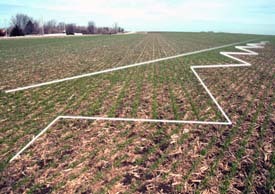 The design is a single per tank design, providing for faster fill times. 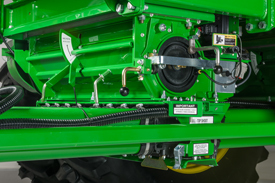 The front 50 bushel tank has two options to make loading low rate products easier. 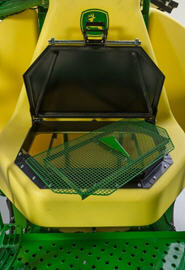 If the grower is filling the tank with bags, the front lid is accessible from the lower platform of the cart. The two front railings of the cart can be removed to allow for a truck to bring bags directly to the platform. As pictured above, the bottom fill location of the front tank has a bag splitter. The stairs to the platform are 33.02 cm (13 in.) 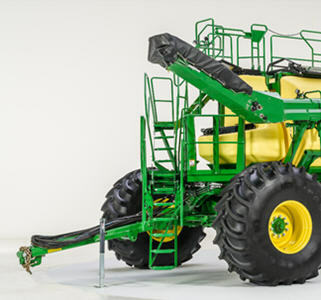 from the ground and feature wide, tall, and sturdy handrails that will support operators as they carry bags to the dedicated low-rate, 1762-L (50-bu) tank on the bottom platform. 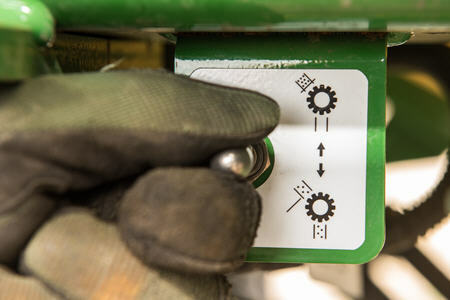 A wheel-speed sensor will automatically fold the stairs as the air seeding train moves. The powered stairs also have a manual release. The stairs are equipped with compression springs to make folding up the stairs manually an effortless task. The lower platform was designed with comfort and convenience in mind. 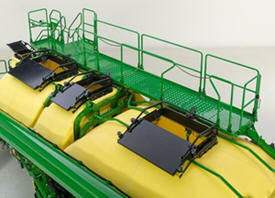 The front two handrails can be easily removed so operators can load from a skid steer or the back of the pickup truck. The stairs allow access to the mini tank when carrying seed bags. The platform has room designed for seed bag storage with cut outs for tie-down straps in the railing. To improve scale accuracy, the upper platform has been isolated from the tanks to eliminate interference. With that design, movement of the platform can be expected. The handrail system is foldable so the handrails are flush with the tank lids. 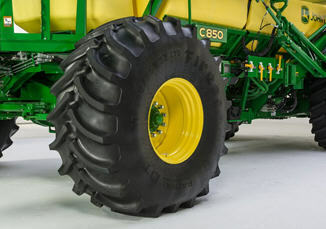 The C850 comes equipped with rear dual Mitas® 800/70R38 SFT tires and front single Mitas 800/70R38 SFT tires as a high-floatation, low-compaction solution. The Mitas tires run at an inflation pressure of 1.3 bar (19 psi). Super flexion tire (SFT) technology means that the sidewalls on the tire are developed with additional reinforcement and superior rubber compounds, which enables the tires to run at a very low pressure while under higher loads without damaging the sidewalls. By running at lower pressure, the tire is able to flex its sidewalls and squat, allowing for a much wider footprint and improving floatation. 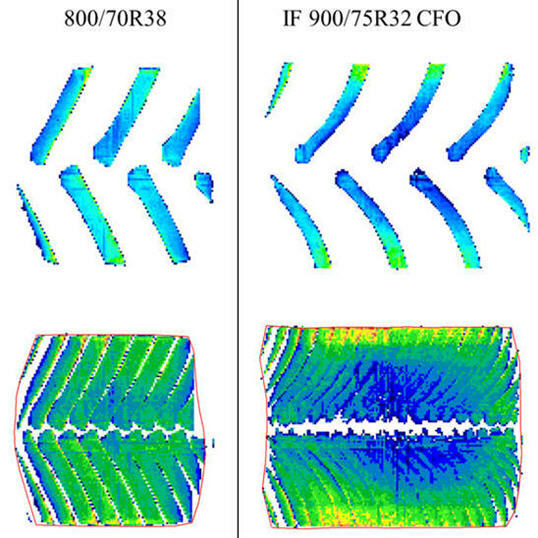 An optional tire package for even greater floatation and decreased compaction includes rear dual Firestone® increased flexion (IF) 850/75R42 CFO tires and front single IF 900/75R32 CFO tires. The Firestone package allows for increased air capacity, which provides greater floatation. 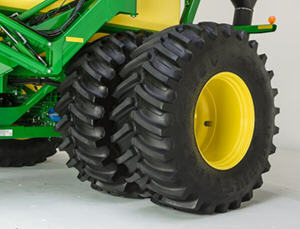 A proprietary side wall compound and radials allow for a lower tire pressure (0.8ba [12 psi]) which provides lower compaction across a wider footprint. 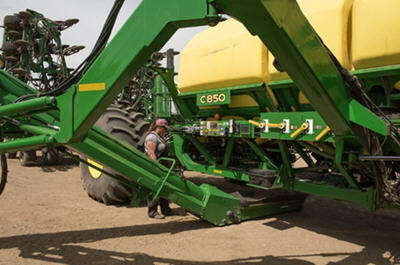 To see how the tire pressures on the C850 Air Cart compare to the 1910 Commodity Cart, please view the tire pressure guide. 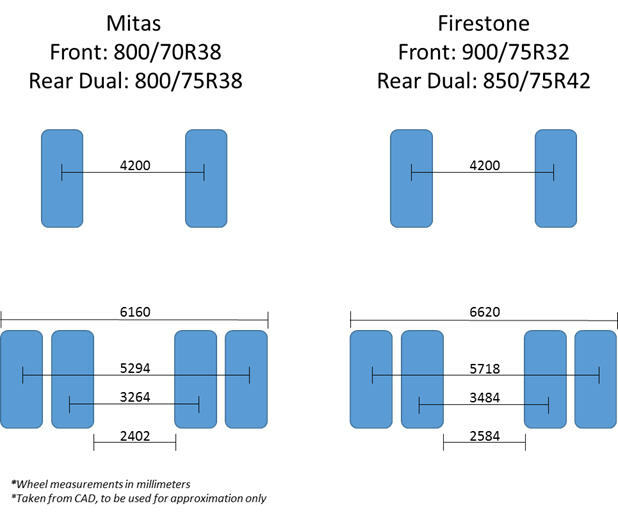 Below is a test conducted by Firestone comparing the impact different size tires have on average flat plate areas and pressures. 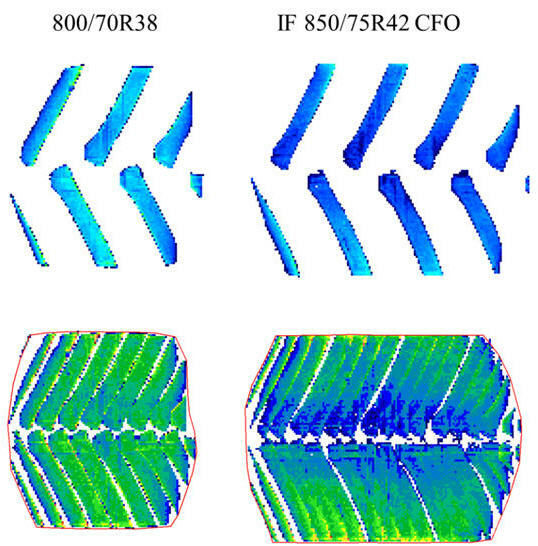 While it is not an exact comparison to the Mitas tires, which run at a lower pressure than what is used in the study, it gives a general illustration of the additional contact area of the high floatation tires. Mitas is a trademark of Mitas, Akciova Spolecnost Corporation. Firestone is a trademark of Bridgestone Americas Tire Operations, LLC.